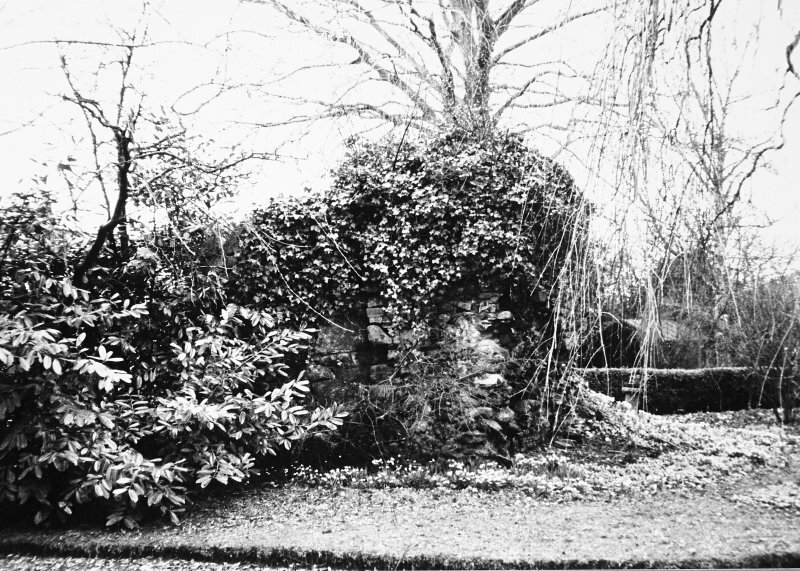 General view of remains of Castle covered in ivy. (NH 5532 5899) Castle in ruins. Depicted as being on an isolated mound about 100 feet overall diameter, and about 40 feet diameter across the top. The Castle was surrounded by a deep ditch. The remains of Dingwall Castle consist of one narrow underground vault and two masses of masonry above ground. The castle site was levelled in 1818. One of the corner towers of the Castle was transformed into a dovecot by Andrew, Bishop of Caithness, a keeper of the castle between 1507-16 A.D. and is still exists as one of the ruined fragments. Dingwall Castle is referred to as the 'Mote of Dingwall' in 1488. Dingwall Castle is marked on a 12/13th century map in the Bodleian Library. D MacDonald, A Polson and J Brown 1931. The remains of this castle are situated in a private garden at NH 5532 5901 and consist of a small circular tower c.3.4 m. in diameter, standing to a height of 2.6 m., with walls 0.5 m. thick. Attached to the northeast side of the tower is a large block of masonry 3.2 m. wide and standing to a height of c.3.0 m, and on the north-west side of the tower project the remains of a wall c.1.5 m. long, c.7.0 m. to the west of the tower is a large mass of masonry covered with ivy, probably the remains of a wall. This stands to a height of c.3.0 m. but no other measurements could be taken with any degree of certainty. C.10.0 m. to the south-west of the tower is the entrance to a small underground barrel vault, measuring 5.0 m. in length, by 1.8 m. wide and 1.7 m. high. At a distance of c.2.0 m. back from the south enclosing garden wall the ground slopes down gently towards the wall forming a shallow ditch with a maximum depth of c.1.0 m. about 5.0 m. from the wall. This ditch, which looks the result of landscape gardening, extends from the east side of the carriage drive for a distance of c.8.0 m. before fading out, and the owner, Col. John W. Stevenson, believes it to indicate the course of the ditch which formerly surrounded the castle. The remainder of the garden is level with no indication of a motte. The dovecot is at NH 5526 5893. It is an octagonal unroofed tower of red sandstone c.3.7 m. diameter with walls 0.6 m. thick. It was probably of two storeys with a parapet top but thick ivy now obscures the top of the tower. Its present height is c.4 m. The ground floor has gun loops in three of the south facing sides, a fireplace and a doorway in the east side. A number of stone pigeon boxes have been built in to the sides of the building. 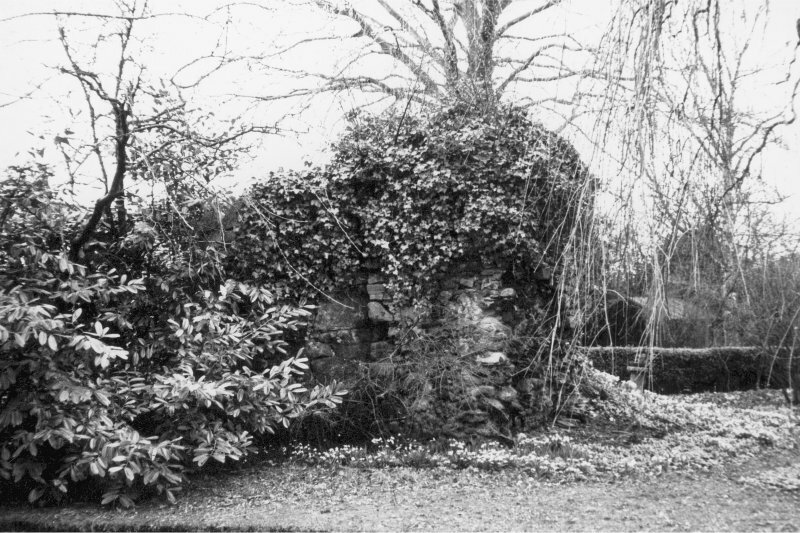 The dovecot is probably later than the other remains. Published Survey (25" 1904) to be amended by field surveyor. Visited by OS (W D J) 17 April 1963. (Location cited as NH 471 588). Motte noted at Dingwall. Castle / motte - eroded, poor state - turfed mound left; houses built on top. The exact age of the castle of Dingwall is unknown, although along with Dumbarton Castle it was one of two Scottish royal strongholds marked on Matthew Paris' map of 1259 (MacDonald, n.d., 47). It was first held for the crown by the Mormaer of Ross and in 1291 it was held by William of Braytoft who delivered the fortress to John Baliol on Edward l's orders. After the reconciliation of Robert I with William, fourth earl of Ross, Dingwall Castle became the seat of that family until their forfeiture in 1476 (MacDonald, n.d.,47). James IV on a number of visits to Tain stayed in Dingwall Castle and the crown continued to appoint keepers until 1584 when James VI granted it to Sir Andrew Keith who was subsequently created Lord Dingwall (MacDonald, n.d.,47). By 180ls the castle was in ruins and the present castle was erected in 1820 by a naval man who had served in the Napoleonic wars (MacDonald, n.d.,49). 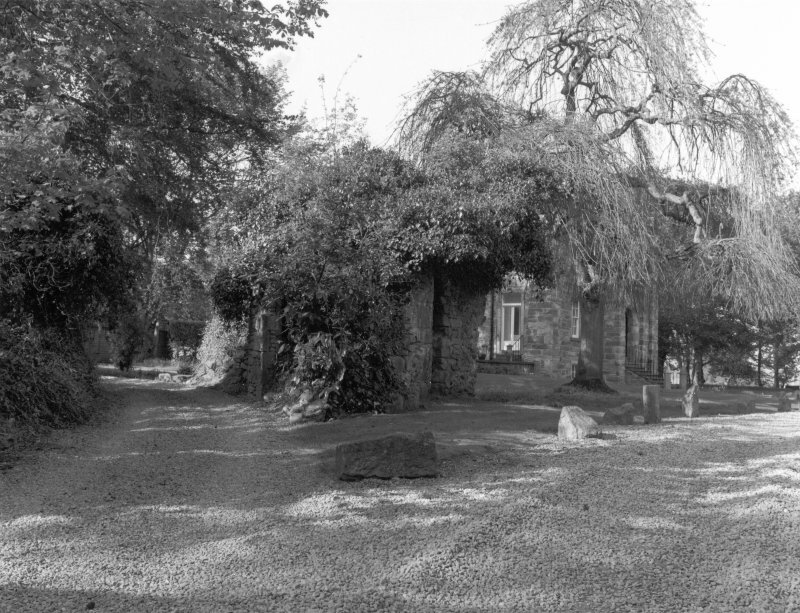 Only fragmentary remains survive of the royal castle of Dingwall in the grounds of the present castle which was largely erected on the site of the former. The castle stood close to the shore on about half an acre of ground and was surrounded by water except along the line of the present Castle Street. A fosse which surrounded it could be traced as late as 1841 (NSA, 1841, 221). The remains of the royal castle primarily consist of one narrow underground vault and two masses of masonry above ground. One of the corner towers was converted into a dovecot by Andrew, Bishop of Caithness, keeper of the castle between 1507-1526 a.d. and still exists as one of the ruined fragments (Ordnance Survey, Record Cards, NH 55 NE 4). 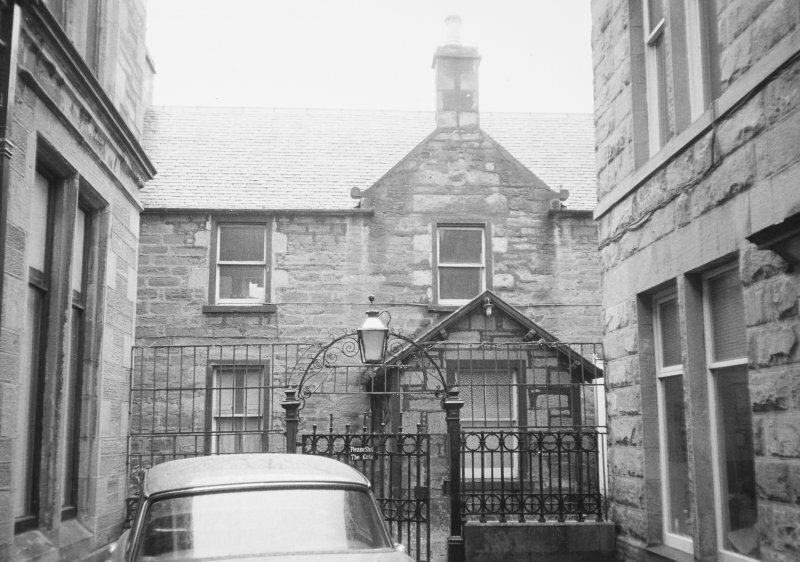 Information from ‘Historic Dingwall: The Archaeological Implications of Development’ (1982).